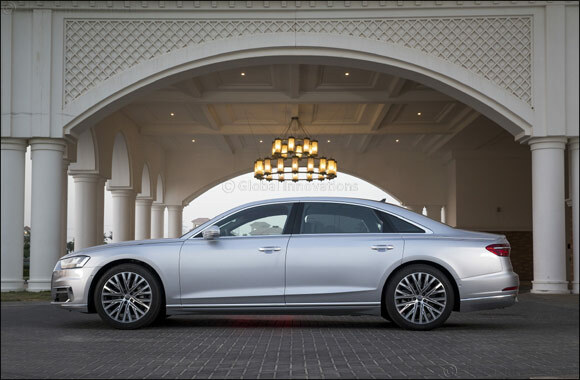 Abu Dhabi, 05 August 2018: Abu Dhabi is leading the way for regional sales of the luxury all-new Audi A8, achieving 100 per cent of their sales target for May, June and July, outselling all other GCC markets for this flagship model. The Abu Dhabi based dealership also achieved the highest number of new car sales across the Middle East region for the month of June. The Audi A8 was recently voted as ‘World Luxury Car 2018” at New York Auto Show by a panel of 82 jury members from 24 countries. Criteria assessed included the emotional appeal, passenger comfort and safety, environmental aspects as well as driving performance, market relevance and price-performance ratio. The flagship model was also voted as the most innovative model of 2018 at the “Automotive Innovations Award” presented by the Center of Automotive Management and PricewaterhouseCoopers AG. Mark Austin, General Manager at Audi Abu Dhabi commented, “Featuring strikingly stylish design outside and in, combined with the superior performance synonymous with Audi, the all-new Audi A8 provides the ultimate in luxury and sophistication, something which clearly has a strong appeal to our customers in Abu Dhabi and Al Ain. We are seeing a return of confidence in new car sales in general, and we are proud to achieve 100 percent of our targets for the last two months. We are predicting this success to continue into the second half of 2018,” he continued. The successful all-new Audi A8L is available in the UAE with a 3.0-litre V6 turbo engine that delivers 340hp and has quattro all-wheel drive fitted as standard.